While market leaders in computer industry are busy launching their identical Netbooks, the Japanese high-end Netbook manufacturer, Kohjinsha, has teamed up with the toymaker, Bandai, to produce a special limited edition Gachapin & Mukku Netbook designed particularly for kids. Both Gachapin and Mukku are well known Japanese television characters who appeared in a children’s program. 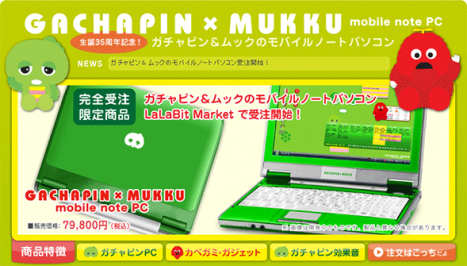 The producer of this Gachapin & Mukku Netbook aims to catch parents as well as kids’ attention when purchasing a Netbook. 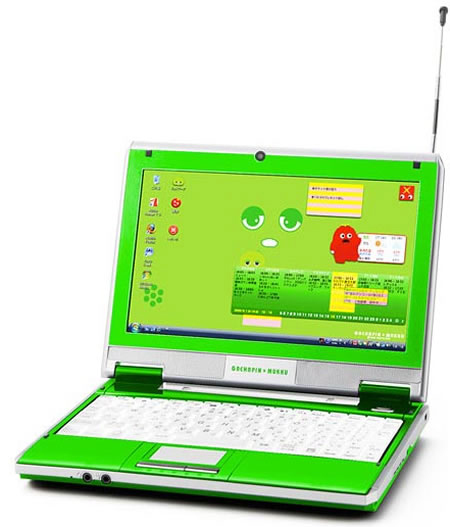 The Gachapin & Mukku Netbook is bright lime green in color. It features a 8.9-inch 1,024×600 display, 160GB 5400rpm HDD, 1GM of RAM, an Atom N270 CPU, a 1.3 Megapixel webcam and a 1-Seg Digital TV Tuner. This kids Netbook is priced at 79,800 yen ($878), approximately 20,000 yen or $217 extra compared to the original Kohjinsha ML netbook that features almost similar functions.